Imagine immigrating to western Canada to farm in the decades before maps could tell you about the land that would (hopefully) support your livelihood: how could you know where the earth would yield healthy grain or where resources such as good lumber were likely to lie? Thousands of farmers moved to unfamiliar territory, many breaking ground and establishing farms kilometres from their closest neighbours. Success was often tied to basic soil fertility, so a lot rested on a common-sense understanding of geography, instinct and simply putting shovels in the ground to test what was there. 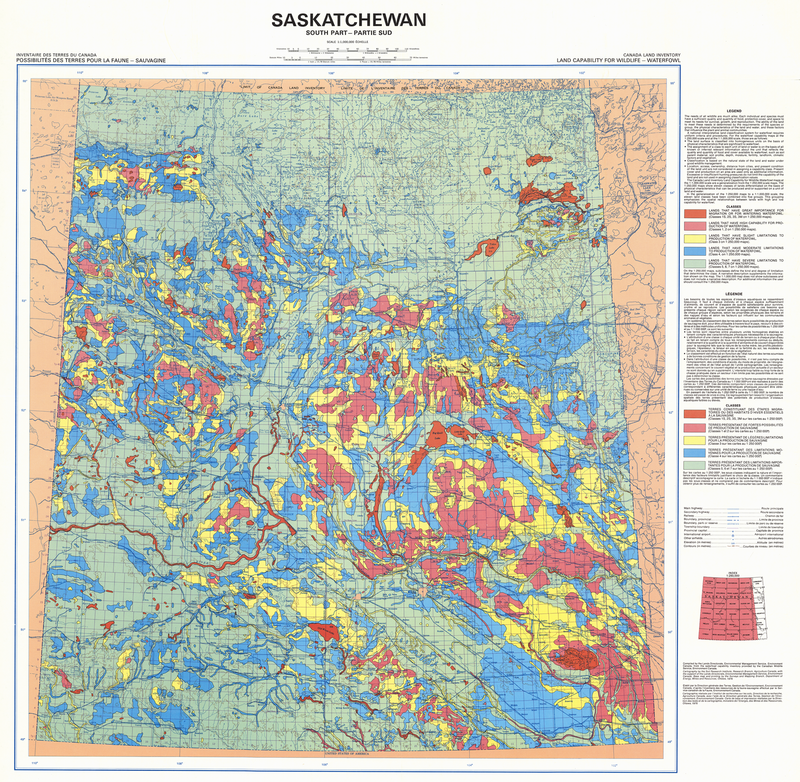 It wasn’t until 1963 that the federal government founded the Canada Land Inventory to, among other things, improve farmers’ chances. Civil servant Lee Pratt was put in charge of the team responsible for surveying an area of more than 2½ million square kilometres and creating comprehensive 1:250,000-scale maps of Canada’s productive and inhabited land. The maps created by the CLI through to the 1980s, it could be argued, had as much to do with post-60s western settlement as the railroads. Farmers sought the darkest, richest soil or the ground best suited to specific crops, and the CLI’s painterly illustrations handily ranked land as being between Class 1 (the most fertile) to Class 7 (no capability for agriculture). And the data sets were hardly limited to agriculture: the same ranking system was applied to forestry, recreation and wildlife (ungulates and waterfowl, the latter of which is depicted on the map below). The CLI would have been an unwieldy undertaking indeed had it not been for the simultaneous Canadian invention of GIS. British expat Roger Tomlinson was in his late 20s and living in Ottawa when he started playing with the new computer technologies of the day as a way of storing, organizing and interpreting spatial data for the aerial survey company he worked for. After a serendipitous meeting on a plane, Pratt asked Tomlinson to head the CLI program that would eventually build the “Canada Geographic Information System,” the world’s first GIS. The technologies that today underpin Canada’s digital land-use maps — not to mention every geographical database — are the sophisticated descendants of Tomlinson’s prototype. Whether expanding existing crops or deciding where to install a solar farm so it doesn’t intrude onto potentially productive and profitable Class 1-3 areas, the information collected by the CLI and the systems that came out of the program continue to shape the way land of all types is used and managed in Canada.